Emergencies: We deal with many wildlife emergency situations. The term emergency can be hard to define, but most often it refers to a situation that the homeowner or property owner would like addressed as soon as possible, preferably immediately. For us, this is no problem. We can usually get out right away, even if it means dropping whatever job we're currently on in order to address your problem. Be it a snake in the kitchen or a rat in the bedroom, we can take care of it. 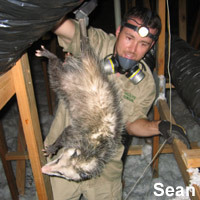 In the photo on the right, we see Sean removing an animal from an attic. Not really an emergency persay, but the homeowner thought it was - she heard a whole bunch of thumping up there, and thought it was a burglar, and called the police! When it was determined to be an animal issue, we rushed right out and took care of the situation. The only thing this opossum was going to steal was a good night's sleep! Dangerous Situations: Some of the emergency situations we deal with are dangerous. We often encounter aggressive or scared wild animals. If a raccoon falls through the ceiling and into a house, for example, it may be desperate to get out, and it might be ready to ferociously defend itself against any attackers. Or sometimes, we are put into a tough situation - such as high on a roof, in order to handle a sticky situation. In this photo on the left, you can see a truly dangerous animal that I had to catch. This is a huge Eastern Diamondback Rattlesnake, the deadliest snake in North America, and one of the deadliest snakes in the world. It got stuck in a suburban back yard (it slithered into the area and couldn't fit through the chain link fence to get out) and it was a true threat to the lives of the people and pets at that home. I safely removed the snake. Fast Response: We know that you want your wildlife emergency taken care of NOW. That's why we all carry cell phones and answer them, 24/7. Very few wildlife removal companies can make this claim. We are ready at all times - with four trucks - to rush out and help you with your wild animal emergency at any hour. In this photo to the right, a raccoon had become stuck in between a wooden and chain link fence at a school. Suffice to say, both the animal and the kids at the school were in danger. Who knows when a foolish or ignorant kid might poke at the animal and get a nasty bite or a disease? 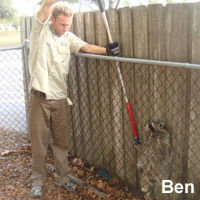 We rushed right out and Ben safely removed the animal before any real trouble could start. Critter in the House: Many wildlife emergencies that we deal with involve critters in the house, the living space, specifically. Sometimes that animal that was living in your attic finds a way through into the home proper. It could be a gap by the air handler, a vent, or the animal could simply claw its way in. 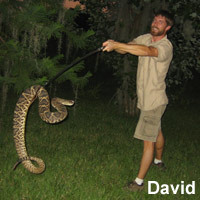 I've dealt with many a panicked homowner who suddenly discovers that they've got a rat or snake or opossum in the house. 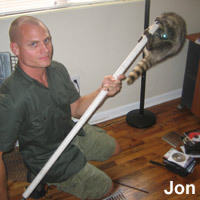 In the photo to the left, we see a raccoon that has gotten into the home. It was just as scared as the people living inside, but Jon safely caught it with a snare pole and removed it from the house, and we relocated it and fixed the hole it made in the ceiling. It's important that a professional with the right tools deal with emergency situations like this, or else a person or a pet could get hurt - after all, a scared animal inside the house will defend itself. Have No Fear: We often deal with wild animal problems because people have fear of wildlife, if not flat-out phobias. As can be imagined, the most common emergency type situations that we deal with involve snakes and rats. These two animals commonly make their way into homes, because they can fit through such tiny spaces. Once inside, they often cause pure terror to the people within - not because they always pose a real threat, but because people are often ignorant about or scared of wildlife. 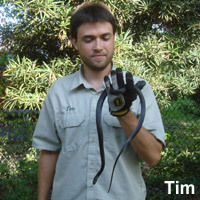 In the photo to the right, we see Tim with a harmless (non-venomous) Black Racer snake. We removed it from a person's house. The homeowner was freaking out at the sight of this fast, black snake, but in truth, it posed no real risk. Still, the person did not want it there, and we were happy to come out to the property to remove it right away.